Includes 7-1/4" Worm Drive Construction Saw w/ Twist Lock Direct Connect - 1677MDT-RT, 24-Tooth Carbide Blade - WD724B, Built-In Saw Hook, Cord not included. The phrase "Plug any 12 gauge extension cord directly into the tool" is from a similar model. With the 1677MDT you need a special twist-lock extension cord, which I had to order directly from Bosch, because it seems no one sells them. Not only an unexpected additional expense, but I also couldn't use the saw at all until the cord arrived. 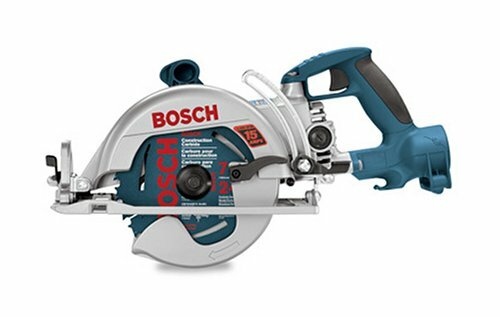 Another thing that's important to know is that Bosch Worm Drive saws take a special kind of 7 1/4 inch blade with a square arbor, not the regular kind of 7 1/4 inch blade with a round hole in the middle. Don't buy this saw unless you want a lot of grief. Why? You will not get the Twist Lock Plug that is nessessary to have before you can plug the darn thing in. You would think that Bosch would not be so stupid to leave this critical accessory out. Think you might pick one up at Home Depo or Lowes? Good luck. I even drove across Dallas to the Bosch Service Center (a couple gallons of gas and lots of traffic) to pick one up after I called to make sure they had one in stock. The clerks don't even know enough about this saw to understand it does require a twist lock and not a regular plug as Amazon states in the description. The clerk at the Bosch Service center just shrugged and said he could special order it. I need that saw tomorrow. I have a number of Bosch tools and I am very happy with them. I have ordered several items from Amazon with no problems. But this time I got lots of problems from both. I'm not a contractor, just a home owner. I will try to make something that will work from an extension cord (12Ga) and a twist lock connector I picked up at Home Depo ($48.38). My advice to you is buy another saw unless you really want the grief and added cost in both time and money. Wonderful Saw, but buy the version with a standard cord. This saw requires a cord with a NEMA L5-20P female twist lock end. I couldn't find one at Home Depot or Lowe's. I needed to use the saw right away so I purchased a standard 25' 12ga extension chord, cut off the female end, and hard wired the cord to the male prongs on the end of the saw. Soldering, heat shrink tubing, electrical tape and an hour and a half to get back to work. This saw uses a diamond shaped arbor. I am using a Dewalt finishing blade. The Dewalt blade comes set up for a round arbor but a piece can be popped out to fit the diamond shaped arbor. Once the saw was up and running, I found it to be a dream to use. This is a really great saw. Mine arrived looking like new a year ago, and still works perfectly. I almost hate to use it--it is such a beautiful piece of equipement. I used this for a few weeks on a job site after one of my guys brought it from home. Best saw for plywood hands down. With the sky hook and cord lock it was great to take up on rafters and roofs. The weight of it doesn't matter when everything you cut comes out better and the saw doesn't bog down no matter what you are throwing at it. The only thing better is having an 8 1/4 wormdrive. Cord not so much of an issue...if you know what you're looking for. 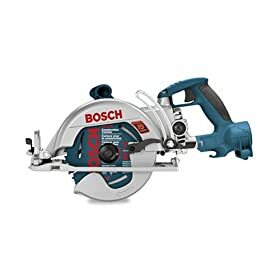 I understand the complaints about Bosch not including a Twist-lock cable with this saw. However, it would likely put this saw just out of the price range for some--as it's already between $150 and $200. I take issue with the idea that you can't find the plug at Lowes or Home Depot; because, I found it at 3 different Lowes stores in my area. The thing to be aware of is this: You are looking for a NEMA L5-20R, not L5-20P. The "R" and "P" refer to "Recepticle" and "Plug," respectively. I found a Cooper Wiring Products L5-20R for about $15 at Lowes and also bought a 12-ga 25' extension cord. I wired the plug and the saw works perfectly. All told, I invested an additional $30 or so for the cord plus $20 for a Freud combo blade. The added expense is well-worth it, though. This saw is a monster. It acts toward wood the way the Little Shop of Horrors plant was with blood--FEED ME! It's a little heavy, but this is not necessarily a bad thing for a HANDHELD wood-eating machine. More weight means less chance of the thing flying up at me on a mis-feed. The most outstanding feature of this saw is how incredibly quiet it is. My blender makes more noise than this saw while not under load. Put it to a sheet of plywood and it's only a slight difference in db's. I believe I couldn't have made a better choice in purchasing a new CS! This is a decent saw. The only problem with them is the direct plug feature. It is nice to plug your extension cord directly into your circ saw but this feature will wear out with use. You'll end up have to gut the direct connect and add a cord to your saw. Or, like a lot of people do, just junk it. I would highly recommend the Skil HD77. Top quality saw that's built like a tank. It is rather heavy, tops out over 16lbs I believe. If that's too heavy go with the Skil HD77m. Much of the steel is replaced with magnesium alloy. This sacrifices some durability but cuts the weight of the saw down by 2lbs.